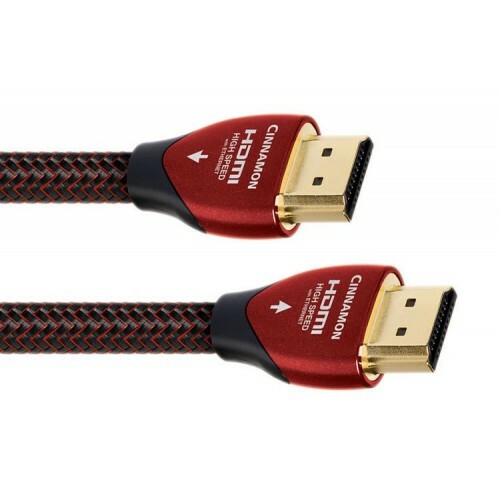 AudioQuest HDMI Cinnamon. HDMI Cable.  In supplier stock. Delivery time 7 days. Cinnamon HDMI adds 1.25% silver-plating to its predecessors’ solid-core conductors. Like all AudioQuest HDMI cables, Cinnamon uses Solid High-Density Polyethylene Insulation, and precise geometry. Specific attention has been paid to maximizing the performance of HDMI, and indeed, AudioQuest’s HDMI cables push sonic performance to new levels. SOLID 1.25% SILVER CONDUCTORS: Solid conductors eliminate strand-interaction distortion and reduce jitter. Solid silver-plated conductors are excellent for very high-frequency applications, like HDMI audio and video. These signals, being such a high frequency, travel almost exclusively on the surface of the conductor. As the surface is made of high-purity silver, the performance is very close to that of a solid silver cable, but priced much closer to solid copper cable. This is an incredibly cost effective way of manufacturing very high-quality HDMI cables. FOAMED-POLYETHYLENE INSULATION: Any solid material adjacent to a conductor is actually part of an imperfect circuit. Wire insulation and circuit board materials all absorb energy (loss). Some of this energy is stored and then released as distortion. Cinnamon HDMI uses air-filled Foamed-Polyethylene Insulation because air absorbs next to no energy and Polyethylene is low-loss and has a benign distortion profile. Thanks to all the air in Foamed-PE, it causes much less of the out-of-focus effect common to other materials.